Hopefully all the yummy crops in your garden are growing well and you can start to see berries, fruit and veg appearing on your plants. If you can, it is likely that pollinating insects like bumblebees have been out and about in your garden. Bumblebees look really cute and with big bodies and tiny wings don't look like they should able to fly. Like me they aren't happy being told what they can't do so they do fly just to spite the mathematician boffins! I thought I'd find out a bit more about them and how they help in our gardens and what we can do to help them in return. 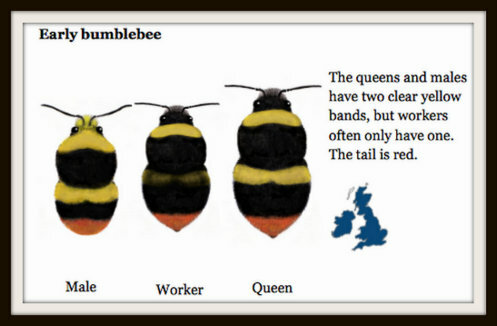 There are 250 types of bumblebee in the world, 24 in the UK but you're likely only see 6-8 kinds in your garden. You can mainly tell the types apart by the colour and number of their stripes. They live in nests of 50-400 bees in the ground or in piles of old leaves (have a look inside a bumblebee nest in this cool BBC video). Each nest has one Mummy who is in charge (just like my home then!) She is called the Queen. The daughters all do the work in the nest and the few sons leave home when fully grown and sleep on flowers. The Queens sleep all winter (a lovely long sleep called hibernating) and then wake in Spring and lay eggs to start a whole new nest. Bumblebees have 5 eyes! They have 3 larger ones at the sides their heads and 3 little eyes on top of their head. Female bumblebees can sting, but only if you scare them. Their stings are like those of wasps- they don't have any sticky-out bits to get stuck in the skin so the bumblebee can remove it and sting again. Honeybees can only sting once. Their buzzing noise isn't made by their wings but by vibrating muscles! Their left and right wings don't flap together, each flaps on its own. The speed and noise that their buzz makes (its frequency) is perfect for releasing large amounts of pollen from tomatoes. Now almost every single European tomato we buy is due to a bumblebee's buzz, wow that's a lot of buzzing as I can eat LOADS of tomatoes all on my own! Bumblebees drink the sugary juice called nectar that's in flowers and they collect yellow dust called pollen to feed to their babies. When they do this they "pollinate" the flowers and that lets them turn into fruit and veg. They are faster pollinators than honeybees as they can visit twice as many plants every minute and all their hairs means nectar sticks all over them. Being bigger they can carry more pollen and so can go on longer foraging trips. They are hardy insects, not put off by drizzle or winds- perfect for Scotland. They are happily active at temperatures down to 10°C. They aren't as scared of enclosed spaces such as greenhouses as honeybees are, so do more of the pollinating on indoor crops. In fact some bumblebees are grown just to pollinate crops such as tomatoes, courgettes, strawberries and peppers grown by farmers inside greenhouses. In the UK bumblebees, solitary bees and hoverflies also pollinate 97% of our wild flowers. 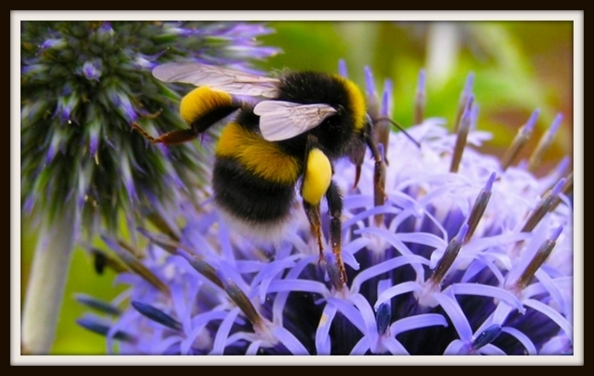 2 types of bumble bee have disappeared from our gardens in the last 80 years. If we don't want to lose any more types we can grow their favourite plants in our gardens. Wild flowers such as foxgloves, daisies and buttercups have lots of nectar and pollen. Our countryside used to be filled with wild flower meadows but these have been disappearing. We can plant these in our garden. Or we can plant tasty herbs such as rosemary, chives, thyme, sage and marjoram to feed bumblebees and us. Remember to try to plant different flowers that bloom from Spring through to Autumn- we'd not be happy if we could only eat in June and July! Also, different types bumblebees have shorter or longer tongues so need flowers of different sizes too so they can find their perfect fit- just like Goldilocks and the 3 bears! Some bees manage get around this problem by nibbling a teeny hole in the base the flower so they can still get access to the nectar- how smart are they?! My garden is pretty bee friendly! Learn how bumblebee friendly your garden is by finding out your Bee kind score and then you'll get help picking other favourite bumblebee flowers to plant alongside those you already have. My garden got a score of 2604, not too bad as the average in Scotland is 2061. If you ever come across a bumblebee lying on the ground looking tired/unwell you can try to help by feeding them a mixture of 1 teaspoon of sugar in 1 teaspoon of water and placing that near the bee's head. It should then stick out its really, really long tongue, lap up the sugary water and then use the energy to fly off. Never try to keep a bumblebee inside, they need to be outside foraging, building a nest or hibernating. 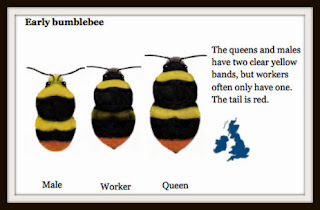 It's fun to learn what types of bumblebee you have in your garden. You need to begin by making sure it is a bumblebee and not a honey bee. Bumblebees are normally bigger and hairier than honeybees or solitary bees. Next work out what colour its tail is and how many bands it has on its body. Finally look to see if there is a ball of pollen (or a shiny surface ready cover with pollen) on its back legs. You can get more help here and you can also download the Bumblebees of Britain and Ireland iPhone app to give you extra help. You can even get involved in the Bumblebee Conservation Trust's Bee Watch survey. You just need to take a photograph of the bumblebees that you see and then upload it to their webpage telling them the date and time the photo was taken. 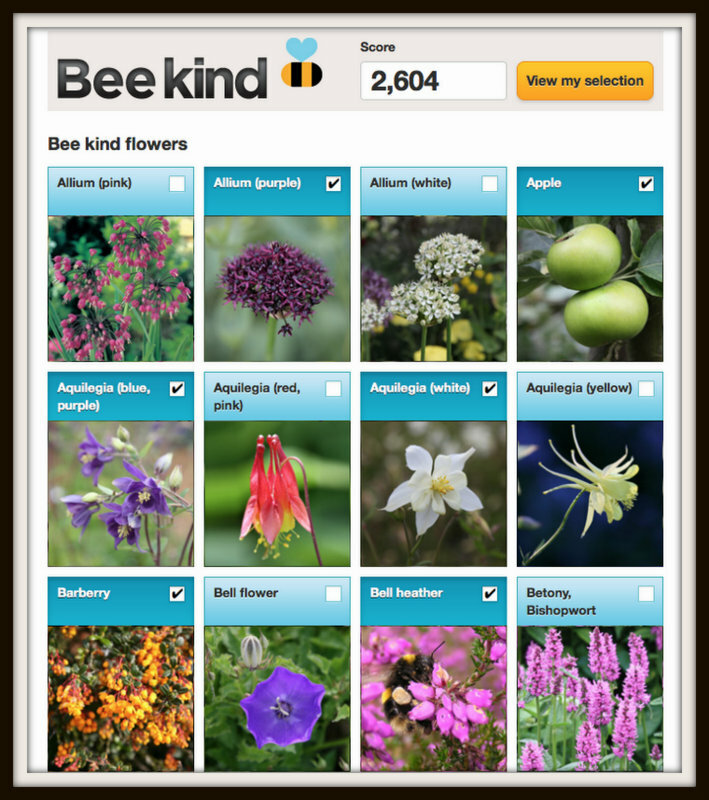 The tools help you iWork out the type of bumblebee (don't worry an expert bumblebee identifier -what a cool job, will check your answer later) and your bumblebee will become part of their survey results. All the results will help brainy people check on what types of bumblebees are found where and how many of them there are just in case any types need extra special help from us. Start by covering the outside of your jar with glue. Wrap a piece of black paper around the jar. Cut the yellow paper into strips. Glue a couple of yellow strips around the black jar to make bumblebee stripes. This bumblebee will have almost as many yellow stripes on his tummy as me! Stick on googly eyes near the top of jar. Make antennas out of pipe cleaners and slip this in between paper and jar. Cut out some wings from white card and glue these onto back of jar. Write numbers on the front to tell everyone how many points you'll get for throwing the cone into that bumblebee. Now you have a fun game where you can take turns to throw the pinecone "pollen" into the hungry bumblebee's tummy. See who can score the most points! 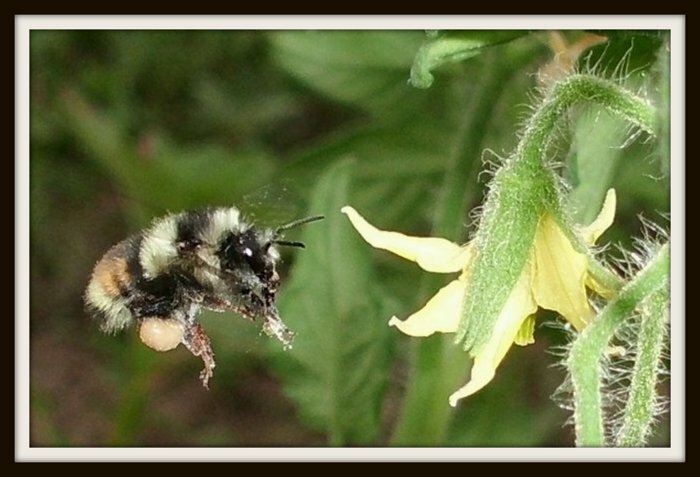 Remember, if you enjoy eating tomatoes and strawberries or looking at pretty wild flowers as much as I do, please help out in the plight of the bumblebees and grow a few more bee friendly plants in your garden.